Une Fleur was originally released by Chanel as a limited edition in 1998 to coincide with the Chelsea Flower Show, and has now been re-released, again as a limited edition. Une Fleur is "inspired" by camellia, and features jasmine and green notes. It is a light, crisp floral, a bit sweet, with a touch of citrus in the top notes. This is my second test, and this is not going to be a full-bottle purchase for me. The jasmine is nice, and I always love a touch of green, but there is some sort of "fresh" accord that I just don't care for. Whatever it is, it intensifies on the dry down. I would rate this 3 out of 5 stars: nice; no desire to own it. 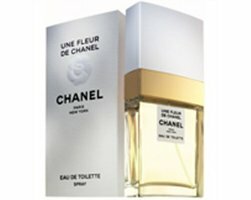 It is certainly worth a try, and might be a hit with fans of Chanel Gardenia. Une Fleur is available in Eau de Toilette only. If I am not mistaken, this is currently exclusive to Saks but will be more widely available in March. The Saks I visited in early January had tons of samples. I love this scent, I wish Chanel would bring it back permanently.